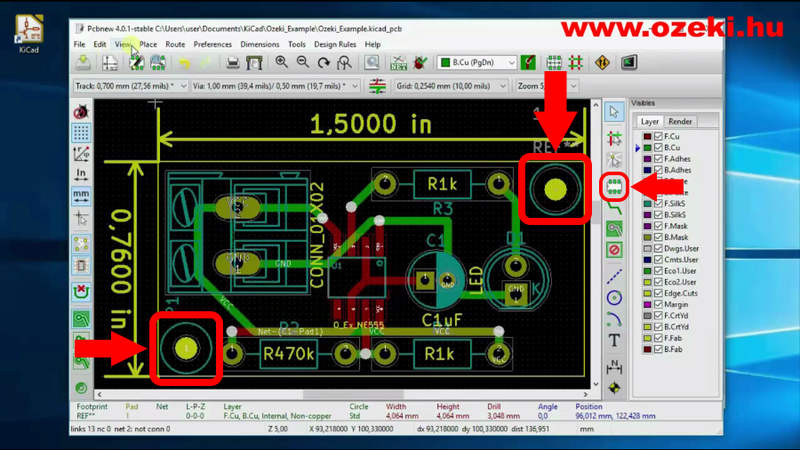 On this webpage you will learn how to create the finished PCB design in KiCad. 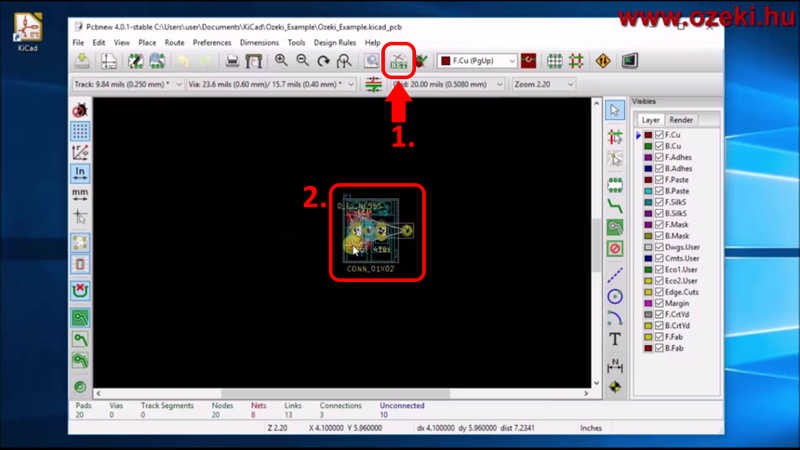 For this tutorial you will need the netlist file generated in the last tutorial. The netlist file contains the schematics and the footprints belonging to the components. You can just sit back and see your PCB components added onto your design. If you are a visual type there is even a 3D view for you. 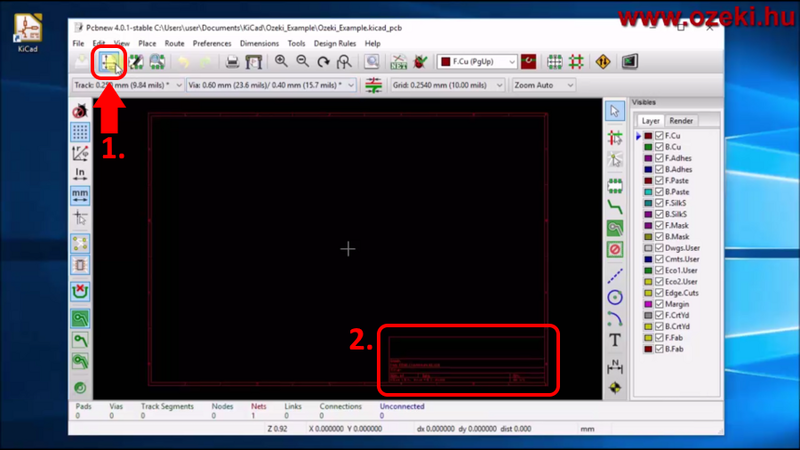 Now that the netlist is ready if you would like you can close the electronic schematic editor and please open the Printed circuit board editor by clicking on the Pcbnew icon (Figure 1) on the KiCad main window. 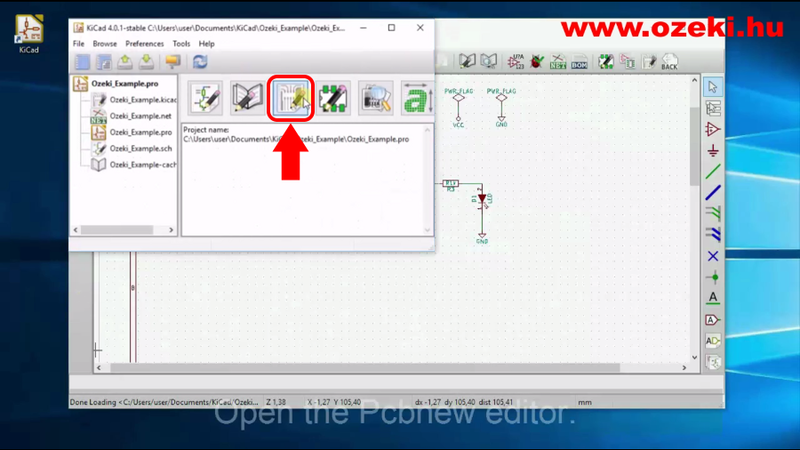 This editor is used for designing the PCB board by placing component footprints on it and connecting the pads of the components with wires. Before starting designing you need to set the basic properties of the design. In the next tutorial you will print the design and this is why this is so important so please open PCB properties (Figure 2 - 1.). After filling out the form you will see some of the properties on the bottom of the page (Figure 2 - 2.). Now you need to select the grid that you would like to use for your design by choosing the appropriate option with the right mouse button pop-up menu. Now it is time to load the netlist (Figure 3 - 1.) and start designing for real. The netlist contains the components, the footprints and the schematics. After loading the netlist you will see all the footprints added onto the design (Figure 3 - 2.). Now you need to set the design rules and with the rules set you need to draw the connections between the footprint pads. These connections will be the copper wires left on your PCB board these wires will carry electricity. With KiCad you are able to design 2 sided boards. The 2 layer sides for the wires are 'F.Cu' (front copper) and 'B.Cu' (back copper). You can find these layers in the right column (Figure 4). If you would not like to screw your board onto a surface you can leave out this step. Otherwise you will need NPTH drill holes for the screws. Add the holes by clicking on the correct icon (Figure 5) and clicking on the black surface. Click 'Select by browser' from the pop-up window and choose 'Connect/1Pin' by double clicking on it. You will see a hole placed on your design. By right clicking on the middle of the hole and selecting 'Pad on.../Edit pad', you can set the parameters of the hole. You need to set it to NPTH, add 'B.SilkS' to the technical layers, set the diameter dimensions and clearances. Now you need to select the outline of the copper zone starting with clicking on the green icon as seen on the right side of Figure 6. Select one of the corners of the frame and choose the type of copper zone you would like to create and select the border of the zone. In our example the zone border is equal to the border of the board. You need to duplicate the zone to the front layer too (right click 'Zones/ Duplicate Zone Onto Layer'). When the zone borders are ready you will see 45° lines crossing each other. The green lines represent the back border while red lines represent the front border. 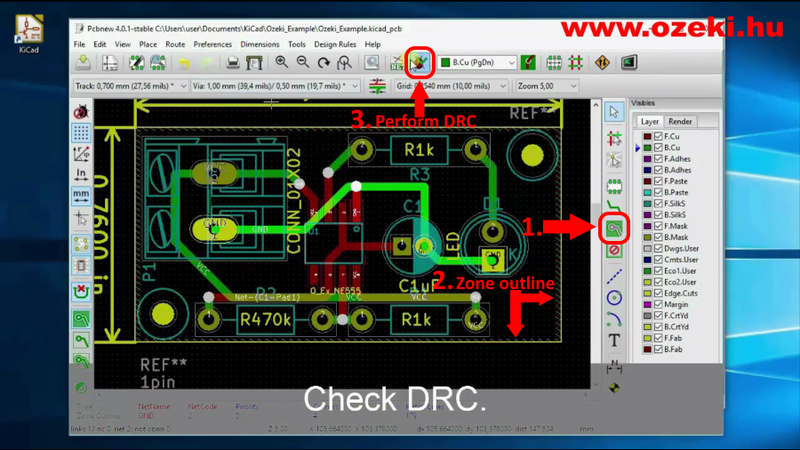 To fill out the copper zone you need to perform a DRC (Design Rules Check). Figure 6 shows how to start it. The design rules check is capable to do multiple tasks like filling and testing zones or discover unconnected pads but if you try it out you will see the number of numerous tasks it can do. 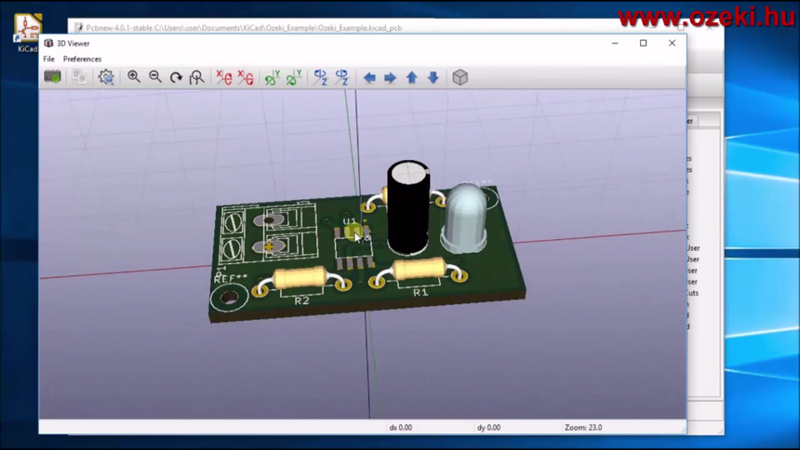 If you would like to see your PCB board in 3D like it is shown on Figure 7, you can find the '3D viewer' in the 'View' menu which is one of the top menus. 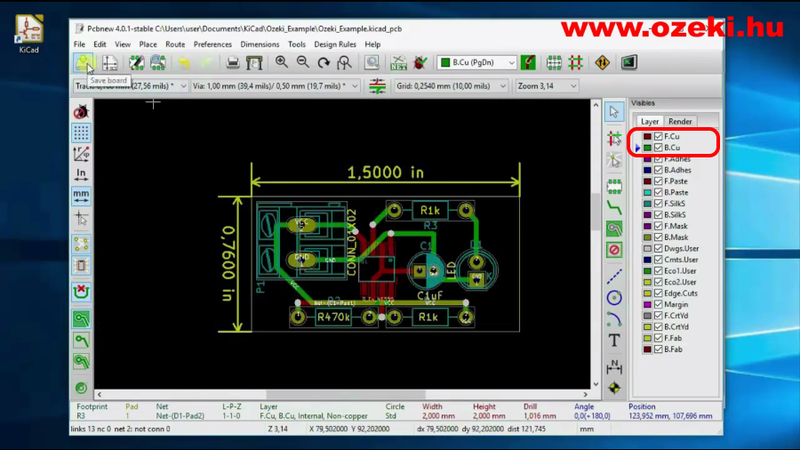 You can watch the 3D view anytime during the PCB design. But if you would like to see your board in the real world, jump to our next tutorial where you will learn how to physically make the board.